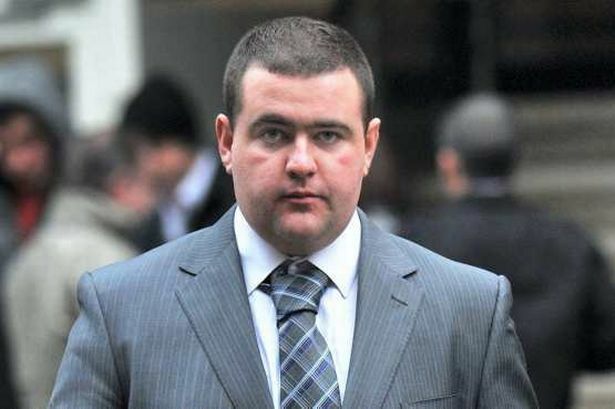 EDL supporters receive suspended jail sentences for beating up a Muslim at a tube station. Salvatore Allegro, 48, and James Whitbread, 36, were both found guilty of a racially aggravated public order offence for beating up a Muslim at a tube station. The men verbally abused Ahmed Farhan, telling him to “go back to your own country you f***ing Muslim c**t.”. When Farhan got off the train at Bank station the two men followed him, shouting anti-Muslim abuse before punching him repeatedly. Both men were given a six month prison sentence, suspended for 18 months. They were also both banned from engaging in any EDL activities, meetings or protests for 18 months. Allegro was made to carry out 120 hours unpaid work while Whitbread was given an 18 month supervision requirement..The duo must each pay Mr Farhan £100 compensation as well as prosecution costs of £150. A Lincoln man has been issued with a Criminal Anti-Social Behaviour Order (Crasbo), following his attendance at an English Defence League demonstration in Newcastle last year. Shane Overton (38) of Parker Avenue, Lincoln, was granted a 10-year Crasbo at Doncaster Crown Court yesterday, Wednesday March 9, which prevents him from attending any public meeting organised by the EDL. Overton entered a guilty plea racially aggravated public order (section 5 Public Order Act) following an incident on a train at Doncaster on May 29 last year, for which he was arrested by British Transport Police. DC Andy Haworth from the National Domestic Extremism Unit, a national police unit who worked alongside BTP and Lincolnshire Police, said: “It is only the second time a Crasbo of this nature has been granted to individuals participating in Defence League demonstrations, and it is widely anticipated other police forces will follow suit and apply for Crasbos to stop violent individuals from subverting other wise legitimate, lawful, protests. “While the Defence Leagues are entitled to protest, violence has been a persistent feature of their demonstrations, and on this occasion on the offence was committed while travelling from a demonstration. Chief Inspector Tom Naughton of British Transport Police said, “Racist abuse of any sort is unacceptable, but the nature of Overton’s insults levelled at a family minding there own business sat on the platform were despicable. “Everyone has the right to travel without fear of abuse or threatening behaviour, and when that behaviour is further exacerbated by racist undertones, our stance becomes firmer still. The local CPS Criminal ASBO lead, Yvette Levy, said: “No one should be made to feel fear or concern for their safety purely because of the language they speak or the colour of their skin. Overton’s victims were subjected to racially offensive language whilst patiently waiting for their train. “The extreme views expressed by Overton caused two children to cling to their parents in fear. “We have worked closely with the National Domestic Extremism Unit to ensure the strongest possible case was built and that any ASBO imposed against him would truly prevent further offending and protect the public. ‘I’m British … go back to your own country’ Racist rant at Asian police officer. A BRADLEY man has admitted racially assaulting an Asian police officer. 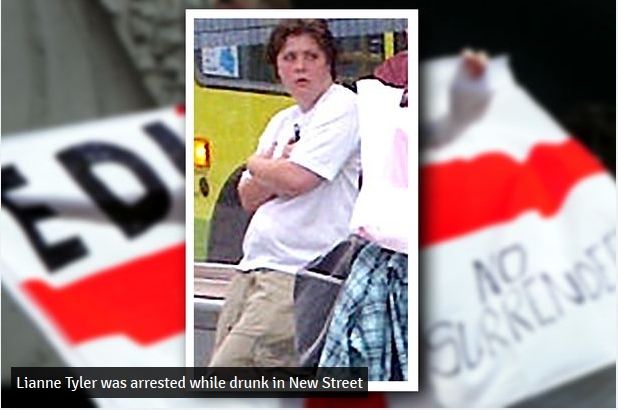 And a court heard he then made an English Defence League salute after he was arrested. Laszlo Michael Lankovits, of Elder Road, Bradley, pleaded guilty to a racially aggravated public order offence on May 21. Kirklees Magistrates were told yesterday that the remarks were made when Lankovits was arrested at his mother’s address for breaching bail conditions. He told the court that once in custody Lankovits then shouted out EDL before putting his hand to his chest and making a salute. Defence solicitor Jonathan Slawinski told the court that his client deeply regretted his actions and was not a member of the English Defence League. He told the court Lankovits had been to visit his mother on May 21 to discuss “issues” in his childhood. He said: “He readily accepts what has happened. “He made these silly and ridiculous comments at a time he had not taken his medication. The court heard how Lankovits, who served four years with the Royal Engineers, had breached his bail conditions not to go to his mother’s address after he committed criminal damage to his stepfather’s car. Prosecutor Aston Bill earlier told the court: “There was an argument at his mother’s home address. He wanted her to come out and speak to him. Magistrates fined the defendant pounds 180 including pounds 15 victim surcharge. Lankovits told the court after the sentence he was sorry for the remarks. Three English Defence League supporters have been ordered to pay more than £350 each after being found guilty of subjecting rail passengers to serious racist abuse. Tracey Hurley (33), Stuart Parr (28) and a 17-year old youth, who cannot be named for legal reasons, appeared at Wigan Magistrates’ Court on 20 January for trial. The court heard that, on Friday 25 June last year, the trio had attended an EDL march in Bradford and had been on their way home when they travelled from Manchester Victoria to Wigan on a Northern Rail service. During the journey they became abusive and intimidating, subjecting several passengers to a torrent of racist abuse. The abuse began when the three sang songs relating to the EDL and Taliban. At Salford Crescent an Asian man boarded the train and was immediately targeted by the group who shouted derogatory remarks about Allah to the man. A passenger advised a member of rail staff who reported the behaviour of the three to BTP officers. After witnesses were spoken to the three where arrested and interviewed. During interviews they admitted having been at the EDL march and drinking heavily, but denied making any racist remarks or behaving in a racist manner. Hurley, of Kingsley Avenue, Goose Green, was fined £150, ordered to pay £200 costs and a £15 victim surcharge after being found guilty of a racially aggravated public order offence. Parr, of Golborne Place, Scholes, was fined £150, ordered to pay £200 costs and a £15 victim surcharge after being found guilty of a racially aggravated public order offence. The youth, from Ashton-in-Makerfield, was fined £150, ordered to pay £200 costs and a £15 victim surcharge after being found guilty of a racially aggravated public order offence. 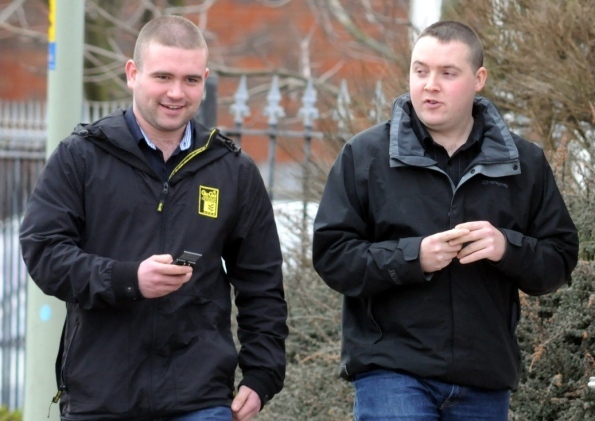 Steven Dryden,left, and Brian Mackey leaving South Tyneside Magistrates Court. TWO men who hurled a tirade of racial abuse at Muslims leaving a mosque in South Tyneside have been spared jail. Brian Mackey and Steven Dryden went to a South Shields mosque after a night out in the town to air their racist views to worshippers who were leaving the building after late-night prayers. Magistrates heard the duo filmed themselves on a mobile phone pledging their allegiance to far right group the English Defence League (EDL) during an onslaught of abuse outside the Baithul Mamur Jame Masjid Mosque, in Baring Street, South Shields. The attack happened on September 5 last year after they had been discussing terrorism and religious extremism in Vogue nightclub, in nearby Ocean Road. Yesterday, the pair were back at South Tyneside Magistrates Court to be sentenced. Bench chairwoman Dorothy Gibson gave each an 18-month community order and also made them subject to a curfew between 7pm and 7am for four months. She told them: You cannot be proud of yourselves. It is only your previous good character that has saved you from jail. Mackey, 26, of Emlyn Road, South Shields, and Dryden, 24, of Fife Avenue, Jarrow, both pleaded guilty to a racially aggravated public order offence when they appeared in court on January 28. At that hearing, magistrates heard how the men did not believe they were being racist and were within their rights to air their political views. Yesterday, their solicitor Jenny Coxon said: Mr Dryden acknowledges that his views can be seen as racist and understands how his actions are in line with the charge he has pleaded guilty to. He said hes not going to join in with any EDL rallies again, because its those beliefs that got him where he is today. Mr Mackey has the stronger views of the two, but they are something that both of them will work on with the probation service.